Ousmane Dembele scored twice as Barcelona thrashed Villarreal 5-1 to continue their record breaking unbeaten run in Spanish La Liga for another match. Villarreal were perfectly outclassed by Earnesto Valverde’s star studded side and the win leaves the Blaugranas just two matches from completing a historic Liga season undefeated. Former Liverpool star Philippe Coutinho opened the scoring for the Catalans in the 11th minute after Dembele’s curling shot was parred by Villarreal keeper Sergio Asenjo and Coutinho’s international team mate Paulinho tapped home a second in the 16th minute after a superb team effort involving a perfect through ball by Andres Iniesta and an inch perfect pass from Lukas Digne. 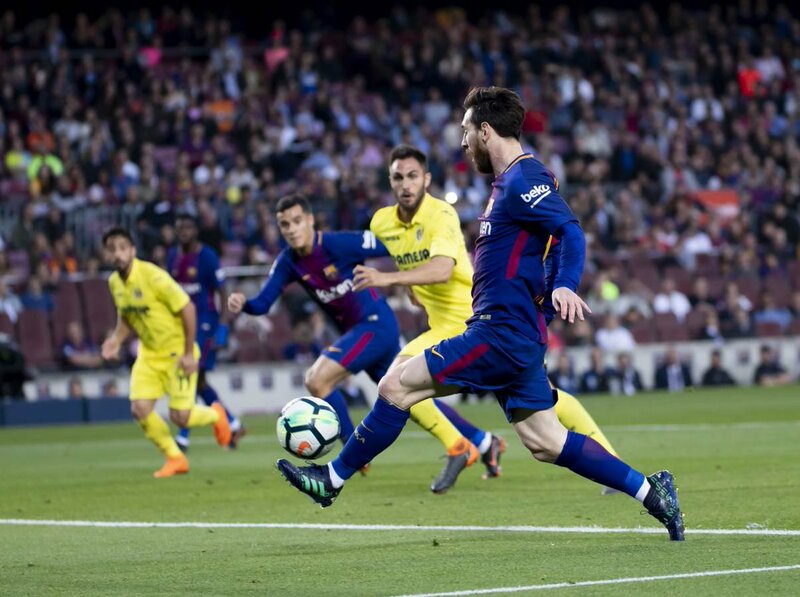 Super star Lionel Messi poked home the third in the last minute of the first half following an exquisite first-time return pass by Iniesta over the defence of Villarreal. This was Argentine’s 34th League goal 3 ahead of his closest rival Liverpool’s Mohamed Salah with two games remaining for the five times Ballon d’Or winner to lift the Golden shoe for the top scorer in Europe. Nicola Sansone pulled one back for the Yellow Submarines in the 54th minute before Demeble’s late double, first in the 87 and the second in the third minute of the stoppage time finished the job for the hosts. The French youngster scored his first into an empty net after a fine pass by Ivan Rakitic and then doubled his tally with a superb goal after picking the ball up on the halfway line, overcoming several defenders and chipping it over Asenjo from the edge of the box. The departing Barca captain Iniesta who was in his fabulous best came off to a standing ovation just before the hour mark. Just two games to go Barca now remain on course for a historic domestic season without tasting a single defeat. Valverde’s side are looking to avoid defeat at Levante and at home to Real Sociedad in the next two weekends to become the first team in the modern era to go a whole La Liga season unbeaten. Real Madrid have achieved this landmark in 1931-32 season when there were only 18 games in a season.